The Red Sox have traded PawSox right-hander Graham Godfrey to the Pittsburgh Pirates for cash considerations, the club announced. He was assigned to Triple-A Indianapolis, the team Pawtucket lost to yesterday in extra innings. 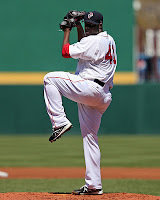 Acquired by Boston from Oakland in December, Godfrey pitched 42 1/3 innings with the PawSox this season while serving as a piggyback starter for Rubby De La Rosa, a spot starter and a reliever. He had a 3.83 ERA with 30 strikeouts to 19 walks. The Red Sox have set the roster for their Dominican Summer League affiliate. Right-handed pitcher Jose Almonte, second baseman Alejandro Basabe, and his twin brother, outfielder Alexander Basabe highlight the 2013 squad. The DSL season begins on June 1 when the Sox visit the DSL Rays. Almonte was signed to a $610,000 deal at the beginning of the international signing season by scout Manny Nanita. The 6-foot-2, 175-pound right-hander out of the Dominican Republic is the most highly touted member of the DSL staff. The Basabe twins, from Venezuela, signed in August to deals of $450,000 apiece. 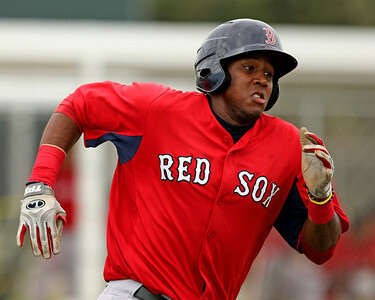 Born August 26, 1996, they are the youngest players currently under contract with the Red Sox. 5/31 Cup of Coffee: It was a tough night on the farm, as none of the affiliates could manage a win. Pawtucket took a tough loss in extra innings, Portland and Salem struggled at the plate, and Greenville lost in a slugfest. Pawtucket fell 3-2 in 10 innings to the Indianapolis Indians (PIT), who earned a split of the four-game series. Steven Wright, starting for the PawSox, allowed two runs on six hits in 5 2/3 innings, while striking out five and walking three. Wright was matched by old friend Kris Johnson, as the Red Sox top pick back in 2006 limited Pawtucket to a pair of runs in seven innings. The game remained tied due to the work of Pedro Beato, who threw 2 1/3 shutout innings, allowing only two hits. The Red Sox have signed third baseman Mario Martinez to a minor league contract, and assigned him to Greenville. In another move, pitcher Madison Younginer has been promoted to High A Salem. Martinez, 23, originally signed by the Mariners as a 16-year-old in 2006, and he debuted for in the Arizona League the following summer. A strong start to his career earned Martinez recognition as a Northwest League All-Star in 2009, and he was rated the top ten prospects in the Seattle system Baseball America in both 2009 and 2010. However, he struggled with strikeouts as he moved up the ladder, and topped out in the High A California League. In less than two years since he received a surprise call-up from extended spring training to Low A Greenville in June 2011, Portland shortstop Xander Bogaerts has used each trip to the plate to improve on that younger version of himself. Those efforts have unequivocally paid off thus far. Bogaerts has appearances in the World Baseball Classic and MLB Futures Game under his belt, and at age 20, he is one of baseball's most dynamic prospects. 5/30 Cup of Coffee: Offense was the name of the game on Wednesday, with the Red Sox’s affiliates combining to outscore opponents 30-13 behind the strength of five long balls. The farm was a late Salem rally away from a clean sweep. Graham Godfrey recovered from a rough first inning to go a solid five, paving the way for an 8-2 Pawtucket Red Sox win over the Indianapolis Indians (PIT). The righty scattered six hits and two walks, yielding only those two first-inning runs and fanning two in his longest outing in three weeks. The Red Sox had been playing with a 12-man bench since Friday, when right fielder Shane Victorino and third baseman Will Middlebrooks were placed on the disabled list. 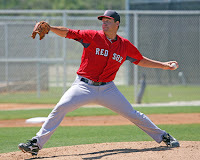 Matt Barnes entered the 2013 season as arguably the top-pitching prospect in the Red Sox system after a strong 2012 season in Greenville and Salem. Barnes was expected to excel in the lower levels as a college pitcher with a solid three-pitch mix, and he did dominate hitters, especially in Low-A. Starting this season off in Portland was expected to provide a sterner test of Barnes' arsenal, as the jump from A-ball to Double-A is one of the most difficult in the developmental process. Barnes had been inconsistent early in his time with Portland, struggling in three of his first four starts. Over his next three starts, Barnes seemed to have turned the corner, and it was in this stretch that I was able to catch him. 5/29 Cup of Coffee: Jackie Bradley Jr. reached base twice in his last game before being called up to Boston, Matt Barnes turned in a quality start for the Sea Dogs, and Salem won in dramatic fashion. In Greenville, the Drive's struggles continued, as they dropped their 37th game of the season. A four-run second inning propelled the Indianapolis Indians (PIT) to a 7-2 victory over the PawSox. The Indians belted a solo home run and a three-run home run off PawSox starter Terry Doyle in the second, and their pitching staff was able to make it hold up. Doyle allowed five runs in 6 1/3 innings, while Chris Martin saw his 29 1/3 scoreless inning streak get snapped on an eighth-inning home run from Boston College alumnus Tony Sanchez. 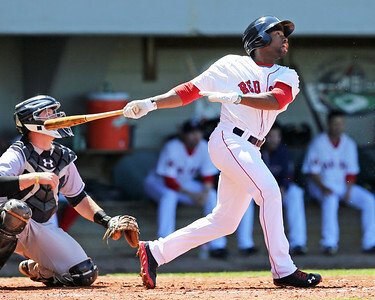 A pair of first-round picks who are at opposite ends of the farm system took home this week's Player and Pitcher of the Week awards, as the SoxProspects.com community voted PawSox outfielder Jackie Bradley Jr. (pictured) and Greenville starter Brian Johnson as the top performers for the week. This is the second Player of the Week award for Bradley, but his first in 13 months, while Johnson earned his first career Pitcher of the Week award. 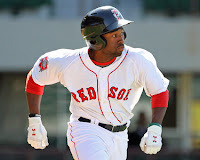 5/28 Cup of Coffee: In Memorial Day play, Jackie Bradley, Jr. (pictured) was at the center of the action, leading Pawtucket to the only victory of the day. Portland was unable to hold on after a late comeback, while Salem and Greenville struggled to generate offense. In a battle of first-place teams, North Division-leading Pawtucket pummeled the West Division's first-place Indianapolis Indians (PIT), 9-1. Bradley led off the game with a double, which proved a sign of things to come. He added a home run and a walk, finishing the day 2 for 4, as he extended his hitting streak to eleven games, including two hits in each of his last six. Bradley's contributions were not limited to the offensive side of the ball. Making his second consecutive start in left field, Bradley threw out a runner at third base in the third inning, and another at second in the bottom of the seventh. Back on schedule, Chris Hatfield, Matt Huegel, and Ian Cundall got together to discuss the news of the week, including what depth there is at third base in Pawtucket given Jose Iglesias's move over and why Greenville's lineup is a bit lacking in prospect power. Listener questions included inquiries on Garin Cecchini, Brandon Workman, and Brandon Jacobs. Finally, we hit on what Jackie Bradley, Jr. has been up to since going back to Pawtucket, and discuss whether he'll be back soon. 5/27 Cup of Coffee: Pawtucket was the lone victor on Sunday, as Portland was shut out, and Salem's offense proved tepid. Greenville's comeback attempt against Charleston fell short, handing them their fourth series loss in a row. A mixture of power and steady pitching helped the PawSox chase away the Louisville Bats (CIN), 5-0. Chris Hernandez picked up the victory, twirling 6 2/3 innings and allowing five hits and three walks, while striking out two. Pedro Beato tossed 2 1/3 innings of relief, allowing just two hits and a walk to pick up his first save of 2013. Pawtucket got off to a quick start offensively, plating a run in both the first and the second on an RBI double from Drew Sutton and a sacrifice fly off the bat of Jeremy Hazelbaker. Sutton's sacrifice fly in the fourth gave the PawSox a 3-0 advantage. 5/25 Cup of Coffee: It was a quiet night for the bats of the affiliates, as they managed only 10 runs over four games. The pitching was solid, led by a pair of 2012 draftees in the lower minors. Thanks to a balanced offensive attack, the PawSox were able to edge the Louisville Bats (CIN), 6-5. Pawtucket got on the board first in the top of the second, when Louisville's shortstop made an error to allow one run to score. Later that inning, Drew Sutton hit a three-run double to put the PawSox up by four. The Bats answered right back, plating three runs in the home half of the second off Steven Wright, and they added two more in the sixth to take a one-run lead. Wright allowed five runs on eight hits in 5 1/3 innings. 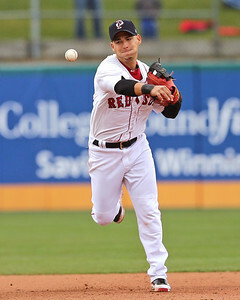 -Jose Iglesias (pictured) and pitcher Alfredo Aceves were promoted from Triple-A Pawtucket Friday as the Red Sox placed Will Middlebrooks and Shane Victorino on the disabled list. Iglesias' call came the same week he debuted at third base, and the Cuban is believed to receive the lion's share of playing time at the position vacated by Middlebrooks. Moving the 23-year-old is not a sign the team is considering converting him into a utility infielder, writes Brian MacPherson of the Providence Journal. In four starts with the PawSox since being demoted, Aceves, 31, went 2-1 with a 3.13 ERA. 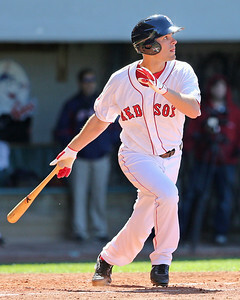 -The Red Sox also demoted catcher Ryan Lavarnway, who was filling in for the injured David Ross. 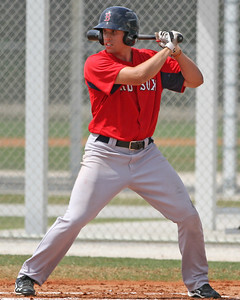 Lavarnway appeared in three games for the big league club, collecting two hits in eight at-bats. 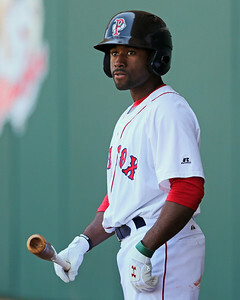 -Jackie Bradley Jr. returned from from the 7-day disabled list Friday after being out with bicep tendinitis. The PawSox will ease Bradley back into the lineup and will be carefully monitor his progress, according to manager Gary DiSarcina. 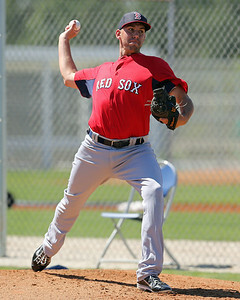 Bradley told SoxProspects.com's Kevin Pereira that "everything's back to normal." 5/25 Cup of Coffee: The affiliates had a memorable evening, as they all proved victorious on Friday. Pawtucket and Salem used solid pitching to obtain their victories, while Portland and Greenville bashed their way to wins. Pawtucket was able to get just enough offense to slip by the Louisville Bats (CIN), 4-3. Allen Webster received the start for the PawSox, going 5 2/3 innings and allowing two runs on four hits, while striking out four. Chris Martin continued his dominance on the mound, hurling 2 1/3 innings of relief, allowing just two hits and striking out four. The Red Sox recalled right-hander Alfredo Aceves and infielder Jose Iglesias from Pawtucket after placing right fielder Shane Victorino (left hamstring) and third baseman Will Middlebrooks (back) on the 15-day disabled list, the club announced on Friday afternoon. 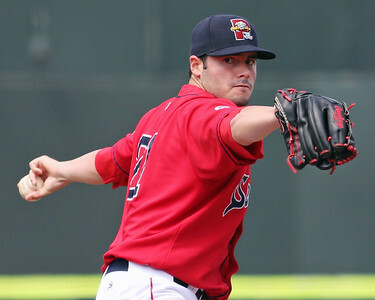 Aceves made four starts with the PawSox after he was sent to the club on April 25. In those four starts, the 31-year-old posted a 2-1 record with a 3.13 ERA, replete with 11 walks and 21 strikeouts in 23 innings pitched. Aceves had a 8.66 ERA in five games with Boston to start the season. Iglesias, who made his professional debut at third base on Tuesday, has hit .202/.262/.319 in 33 games with Pawtucket after he was optioned to the club on April 9. He hit .450/.476/.550 in nine games with Boston before he was sent down. 5/24 Cup of Coffee: Portland picked up the only win on the night, led by its rehabbing battery-mates. Pawtucket had a rough start to its road trip, a Salem rally fell short, and Greenville continues to slide. Pawtucket had an inauspicious start to its eight-game road trip, losing 10-0 to the Louisville Bats (CIN). The Bats lived up to their name, pounding out 17 hits against PawSox pitching. The first 11 of those came off starter Terry Doyle, who allowed eight runs in four innings of work. Infielder Jonathan Diaz was the most successful hurler of the night, allowing two hits in a scoreless eighth and finishing with a strikeout of speedster Billy Hamilton. The Red Sox have signed left-handed reliever Rafael Perez to a minor league contract. The signing was first reported by Jordan Bastian of MLB.com. Perez was released by the Minnesota Twins a week ago. Perez, 31, appeared in 338 games for the Cleveland Indians, all as a reliever, from 2006 to 2012. He was an integral part of the Indians Central Division winning team in 2007, logging a 1.78 ERA and 0.923 WHIP. He may be most remembered to Red Sox fans for allowing back-to-back home runs to Manny Ramirez and Mike Lowell in Game 3 of the 2007 ALCS. 5/23 Cup of Coffee: Between an off day for the PawSox and rain sweeping through the south, the Portland Sea Dogs played the only complete game of the day on Wednesday. They made the most of it, walking off with an extra-innings win. Catcher Christian Vazquez (pictured) stole the show in Portland, finishing the night 4 for 4 with two RBI and a single shy of the cycle in the Sea Dogs’ 5-4 walk-off win over the New Hampshire Fisher Cats (TOR) . His one-out triple in the 10th inning set the table for second baseman Heiker Meneses, who singled to left to plate pinch runner Derrik Gibson to clinch the victory. 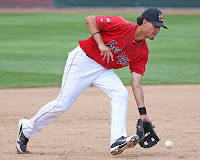 The two lowest affiliates currently in play are represented in this week's Pitcher and Player of the Week, as the SoxProspects community voted for Greenville's second baseman Mookie Betts and Salem right-hander Matt Price (pictured) to take home the weekly honors. This marks back-to-back weeks in which Betts has received the accolade, while Price earns the award for the first time in his career. After not hitting a single home run in 251 at-bats with Lowell last season, Betts increased his 2013 home run total to seven after belting two in 24 at-bats with the Drive this week. He also contributed two doubles, five walks and four steals. The 20-year-old is currently riding a 16-game hitting streak in which he's hitting .403/.500/.742 with five home runs, six doubles and 12 walks. In 23 games prior to the streak, Betts hit .145/.340/.263 with two home runs, one double and 23 walks. 5/22 Cup of Coffee: Pawtucket and Portland pulled off close victories on Tuesday, while John Farrell's son out-hit Salem by himself, and Francellis Montas (pictured) pitched well in a Greenville loss. 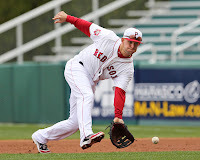 The PawSox held on to beat the Indianapolis Indians (PIT), 9-8, in a crazy matinee. Rubby De La Rosa was scratched from his scheduled start for precautionary reasons. The PawSox tweeted that he tweaked a muscle in his side. Chris Hernandez got the start instead, allowing three runs, one earned, in four innings. Two unearned runs scored in the third after Jose Iglesias made an error in his first career game as a third baseman. After a short hiatus, the guys are back. Chris, Matt, and Jon talk about the goings on in Pawtucket, Portland, and Salem, discussing players like Rubby De La Rosa, Xander Bogaerts, and Garin Cecchini, and also hit on what Mookie Betts is doing down in Greenville. Also Jon's roommate walks in and can be heard in the background at one point. As usual, links after the jump. After dazzling in his first two Grapefruit League starts in spring training, Rubby De La Rosa became one of the most talked-about young players in Red Sox Nation. 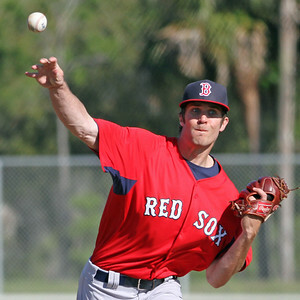 After all, it was his first time pitching in a Red Sox uniform after being sent over from the Los Angeles Dodgers in the offseason to complete the August 2012 megatrade, and he looked dominant while lighting up radar guns with a fastball that grazes triple digits. However, after those first two outings, the reality set in that he still had work to do in developing as a pitcher and returning to form following Tommy John surgery in August 2011. De La Rosa allowed seven earned runs in his next two Grapefruit League outings over 2 2/3 innings, and was optioned back to minor league camp soon thereafter. 5/21 Cup of Coffee: It was a tough night on the farm, as all three affiliates in action came away with losses. Pawtucket rallied but was unable to overcome an early deficit, Portland opened its series with a loss, and Greenville dropped its third straight. A big first inning doomed Pawtucket, as it fell 8-4 to the Indianapolis Indians (PIT). The Indians scored five runs in the first off Steven Wright, the big blow coming on a grand slam by former Red Sox outfielder Jerry Sands. Wright was able to get back on track after the tough start, getting through six innings. Overall, he allowed seven runs (six earned) on seven hits, while striking out two and walking five. Jose De La Torre, optioned back to the PawSox earlier in the day, allowed a run on two hits in 1 1/3 innings, walking and striking out three apiece. After surrendering his first earned run since opening day on Friday, Ryan Rowland-Smith looked to start a new shutout streak. The left-hander gave up two hits in 1 2/3 scoreless frames, walking one and striking out four. The Red Sox announced Monday details for their eighth annual "Futures at Fenway" event, but this year there is a twist: It will be a single game, not a doubleheader. 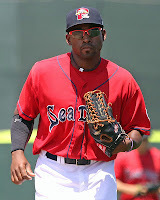 The Portland Sea Dogs and Harrisburg Senators (WAS) will face off at noon on Saturday, July 27 at Fenway Park. A concert featuring "The Kidz Bop Kids" will take the place of the second game. 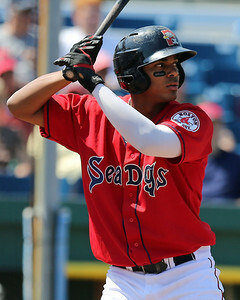 Based on the Sea Dogs' current roster, a number of the SoxProspect.com Top 20 will see action at Fenway: shortstop Xander Bogaerts (No. 1) (pictured), right-handed pitchers Matt Barnes (No. 4), Anthony Randaudo (No. 11) and Brandon Workman (No. 12), left-hander Drake Britton (No. 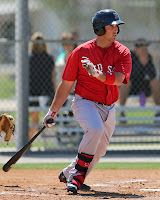 16) and catcher Christian Vazquez (No. 18). Every Monday during the season we will feature a video here from the SoxProspects YouTube page. Today's video is of Matt Barnes' second inning from his start on April 19. In it, he sets down the side in order by striking out two and inducing a groundout to the second baseman. Follow the link to the YouTube page to view more of this start, along with many other prospect videos. 5/20 Cup of Coffee: Pawtucket found itself on the right side of a heralded pitching tussle, while Portland's miscues led to a defeat at the hands of Binghamton. Salem and Greenville each saw their bullpens falter late in stinging defeats. A marquee pitching matchup turned into a lopsided victory for Pawtucket, as they pummeled the Indianapolis Indians (PIT), 11-3. Allen Webster moved to 3-0, tossing 5 2/3 innings and allowing one run on one hit and five walks, while striking out seven. 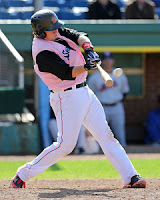 5/19 Cup of Coffee: Both Portland and Salem rallied for exciting victories, with Matt Spring (pictured) and Deven Marrero each earning game-winning hits. Greenville's comeback attempt fell short, as its tough May continued. The Indianapolis Indians (PIT) smacked three home runs and doubled up on the PawSox, 6-3. All six of the Indians' runs came off major leaguers on rehab, as they got to Franklin Morales for five runs in four innings and Andrew Bailey for one run in his lone inning of work. Morales allowed a three-run home run in the third and was pulled from the game in the fifth after allowing a home run to Jerry Sands and a walk to Ivan De Jesus. Bradley: "Everything's back to normal"
PAWTUCKET, R.I. - Jackie Bradley, Jr. yesterday played in his first game since May 3 after he was activated from the Pawtucket Red Sox' disabled list prior to the club's game against the Gwinnett Braves. He finished 1 for 3 with a triple, walk, and strikeout. Bradley was dealing with tendinitis in his right biceps tendon since April 30. The PawSox originally had the outfielder serve as their designated hitter for three games subsequent to the revelation of his injury, but then placed him on the 7-day disabled list on May 6 (retroactive to May 4). PAWTUCKET, R.I. - PawSox outfielder Jackie Bradley, Jr. has been activated from the disabled list, the club announced. He's in Friday's lineup against the Gwinnett Braves, batting leadoff as the team's designated hitter. Bradley was placed on the 7-day disabled list on May 6 (retroactive to May 4) with right biceps tendinitis. He hasn't played since May 3, when he went 1 for 3 with an RBI against the Durham Bulls serving as the PawSox designated hitter. The 23-year-old hasn't played in the outfield since April 27. “He saw [Red Sox director of sports medicine] Dan Dydrek today and he did well throwing in the outfield and running the bases today, so it was kind of a late decision to get him out there and get him some at-bats and slowly progress him in," PawSox manager Gary DiSarcina said before Friday's series finale against the Braves. Two prospects creating a lot of buzz this month are Rubby De La Rosa and Mookie Betts. 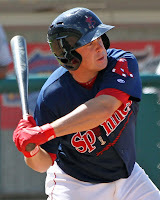 The pair was named SoxProspects Players of the Week for May 6-12. In three starts for Pawtucket this month, De La Rosa is 0-1, but has allowed just an unearned run in 12 innings pitched. The right-hander has also struck out 16 while allowing just six walks. Betts, who hit just .157/.333/.286 in April, has also enjoyed the month of May. The 20-year old has hit .348/.492/.696 with four home runs and seven RBI. Accolades were a common theme for the system this week, as Betts, Mark Hamilton, and Garin Cecchini all won Player of the Week honors for their respective leagues. Anthony Ranaudo has had a resurgence thus far in 2013. SoxProspects Senior Columnist Jon Meoli caught up with the right-hander and discussed his keys for success along with pitching coach Kevin Boles. 5/17 Cup of Coffee: It was a highly anticipated day on the farm, as each affiliate had a top-30 player on the mound. Portland had its biggest offensive output of the season in the only win of the night. Pawtucket saw its late rally fall short, Salem walked off with a loss, and Greenville's May slide continued. Down 6-1 entering the ninth inning, Pawtucket rallied but could not complete the comback, losing 6-4 to the Gwinnett Braves (ATL). Rubby De La Rosa got the start for the PawSox. He got off to a shaky start, loading the bases with a single and a pair of walks in the first, but was able to pitch out of the jam and settle in. Overall, De La Rosa allowed only one unearned run on one hit in four innings, though he walked four and struck out three. It was the fifth consecutive appearance that De La Rosa has not allowed an earned run, a stretch that spans 18 innings. Despite just the one run allowed, he was charged with his first loss of the season. In relief, Chris Hernandez allowed five runs on 10 hits in five innings. 5/16 Cup of Coffee: It was an overall forgettable night for the Red Sox farm system, with High A Salem the only team recording a win. Pawtucket and Portland both fell with knuckleballers on the mound, while Daniel Bard had another ugly outing for the Sea Dogs. A four-run opening frame gave the Pawtucket Red Sox a lead for the first few innings, but after the Gwinnett Braves (ATL) posted pairs of runs in three innings, the visitors left McCoy Stadium with a 6-4 victory. In that first inning, shortstop Jonathan Diaz launched his first homer of the season for his only hit of the night, and catcher Dan Butler knocked in two with a double. NEW BRITAIN, Conn. — On a soggy Friday night, with the Portland Sea Dogs and New Britain Rock Cats (MIN) in the midst of the second half of a doubleheader, New Britain designated hitter Josmil Pinto strayed a little too far from second base for Christian Vazquez’s liking. So Portland’s catcher took the opportunity to show everyone just how good his arm is — again — with a snap throw that beat Pinto back to the bag. Although the throw was not perfect this time, pulling shortstop Xander Bogaerts to the right and allowing Pinto to slide safely back in, it did show the level of trust Vazquez has in his arm and in his teammates to take that chance. It is trust like that, hitting coach Rich Gedman said, that he needs to learn at the plate. 5/15 Cup of Coffee: All four affiliates were locked in close games on Tuesday, with Pawtucket and Salem coming out on top. 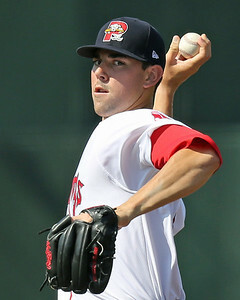 Allen Webster was solid in Pawtucket's win, while Mike Augliera (pictured) was dominant for Salem. Pawtucket improved to 24-15 with a 5-3 win over the Gwinnett Braves (ATL). Allen Webster threw five innings, allowing one run on three hits, while walking four and striking out five. The lone run came on a fourth-inning solo home run. On a cold night in Pawtucket, Webster threw only 49 of his 92 pitches for strikes, and his velocity was a bit lower than normal, but he was still able to have strong results despite not having his best stuff. In the biggest landslide vote this season, Pawtucket right-hander Rubby De La Rosa and Greenville second baseman Mookie Betts (pictured) garnered more than 80 percent of the community vote en route to earning this week's SoxProspects.com Pitcher and Player of the Week awards. Both players receive the honors for the first time in their careers. De La Rosa, SoxProspects.com's fifth ranked prospect, continued his recent dominance this week despite an increased workload. After pitching just 12 2/3 innings in five April starts as a result of a 50-pitch limit, De La Rosa tossed a pair of four-innings outing this week. He struck out 13 while allowing just four hits and walking two over those eight innings, and saw his pitch limit increased to 70 as he tossed 72 pitches in his latest outing on May 11. The 24-year-old has not surrendered a run since April 18, a period which spans over 14 innings (four starts). He's struck out 19 and walked just four over that stretch. 5/14 Cup of Coffee: It was a tough night on the farm, as Pawtucket, Salem, and Greenville all took losses. There were some notable bright spots, however, particularly on the mound. Pawtucket fell 6-1 to the Charlotte Knights (CWS), as the Knights won their second straight to salvage a tie in the four-game series. 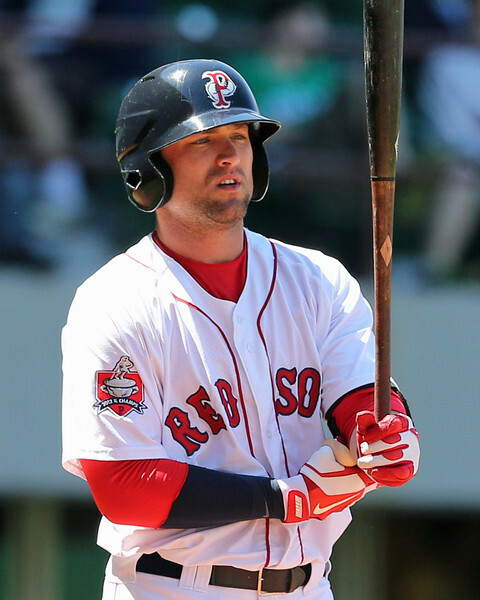 The PawSox generated little offense off old friend Zach Stewart. Franklin Morales made the start for Pawtucket, as he continues to rehab from back and pectoral injuries. The left-hander was solid, allowing a run on two hits in three innings, while striking out four without walking a batter. In a new series, every Monday during the season we will feature a video here from the SoxProspects YouTube page. 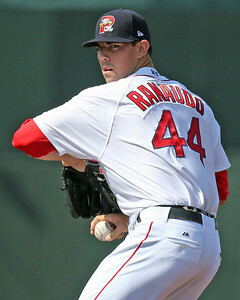 Today's video is of Anthony Ranaudo's first inning from his start on April 20. In it, he allows a triple to lead off the game then a sacrifice fly to the next batter, but quickly stops the bleeding there by striking out the final two batters. Follow the link to the YouTube page to view the rest of this start, along with many other prospect videos. NEW BRITAIN, Conn. – A healthy and confident Anthony Ranaudo used his mid-90s fastball to continue his torrid start to the 2013 season on Sunday, tossing six innings of three-hit, shutout ball in Portland’s 3-2 win over New Britain. Ranaudo kept his fastball, which sat 92-95 mph and reached 96 mph, in the lower half of the zone to keep the Rock Cats at bay and secure his fifth win and third scoreless outing of the season. 5/13 Cup of Coffee: Portland was the lone affiliate victor on Sunday, as Pawtucket and Salem lost close contests. Greenville's early-season struggles continued, as the Drive was overwhelmed by Augusta. The PawSox were unable to take advantage of three Charlotte errors, falling to the Knights (CHW), 6-4. Alfredo Aceves received the loss for his five innings of work, allowing five runs on five hits and four walks, while punching out five. 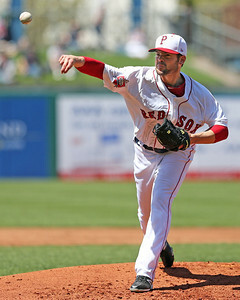 Chris Carpenter pitched well in relief, tossing 2 2/3 scoreless innings, allowing a walk and striking out three. The Red Sox have recalled catcher Ryan Lavarnway from Pawtucket and placed David Ross on the 7-day disabled list with a concussion. 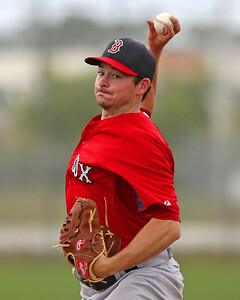 The news of Lavarnway's recall was first reported by Evan Drellich of Masslive.com. In another move, shortstop Deven Marrero has been activated from the disabled list and is in today's starting lineup, Salem announcer Evan Lepler reports. 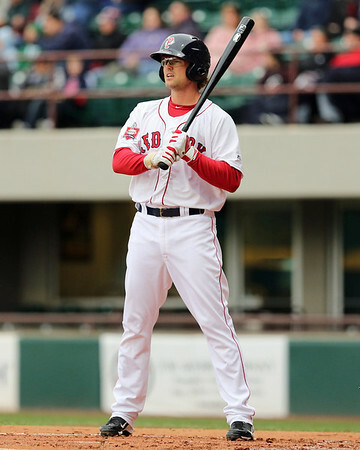 Lavarnway is enjoying a bounce back year with the PawSox, hitting .313/.408/.475 in 22 games. This will be the catcher's second stint with the major league club in 2013. He was recalled for three days in late April, but did not see game action. Lavarnway previously saw major league action in 2011 and 2012. Marrero, the Red Sox top pick in the 2012 amateur draft, had missed 17 games with a hamstring injury suffered in Salem's April 22 game against Wilmington. Marrero was off to a solid start in his first full professional season, hitting .294/.400/.451 in 51 at-bats. He makes his return to the lineup batting second and playing shortstop. 5/12 Cup of Coffee: Two PawSox pitchers dominated on Saturday, while the Sea Dogs wasted a strong start from Matt Barnes. Salem lost a back-and-forth slugfest in walk-off fashion, but the Drive were on the right side of a walk-off victory in Greenville. Rubby De La Rosa and Chris Hernandez combined on a two-hit shutout, as the PawSox beat the Charlotte Knights (CHW), 4-0. After walking two batters in the first inning, De La Rosa settled down, retiring 11 of the last 12, including striking out the side in the second and fourth innings. In all, he tossed a season-high 71 pitches in four innings, allowing only one hit and striking out seven. He has not allowed a run in his last 14 innings, while walking four and striking out 19 in that span. Right-handed reliever Chris Martin (pictured) has been promoted to Triple-A Pawtucket, according to Mike Antonellis on Twitter Saturday morning. Right-hander Jeremy Kehrt has been assigned to Double-A Portland as the corresponding roster move. Martin's promotion comes after he opened the season, his first as a full-time reliever, with 21 scoreless innings across 12 appearances. He struck out 27 while posting a 0.71 WHIP. In the last 1 1/3 inning of Friday's game against New Britain (MIN), he easily set the Rock Cats down while fanning a pair. 5/11 Cup of Coffee: The PawSox continued their winning ways Friday by prevailing in their fifth straight contest. Portland split two halves of a doubleheader, while the Drive powered their way to victory on the strength of three long balls. On the heels of a four-game sweep of the Gwinnett Braves (ATL), Pawtucket downed the Charlotte Knights (CHW), 3-1, on Friday. The three PawSox pitchers, led by starter Graham Godfrey, surrendered only three hits in the contest. Godfrey, 28, gave up two hits and struck out five in six innings of work on the way to his second win of the season. The Red Sox announced their Minor League Players of the Month for April, with Garin Cecchini (pictured) and Anthony Ranuado leading the way by winning hitter and pitcher of the month, respectively. 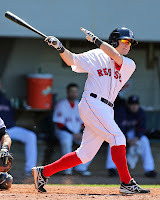 Those match the selections made by SoxProspects.com for April as well. Alex Speier of WEEI.com has the full list of team award winners. Allen Webster and Cecchini took home SoxProspects Pitcher and Player of the Week, respectively, for the week of April 29-May 5. Webster turned one of his best outings on May 3 with a season-high nine strikeouts over six innings, while Cecchini went 9 for 24 with three doubles and two home runs during that span. 5/10 Cup of Coffee: Pawtucket used a 16-hit barrage to close out its series, picking up the only win of the night on the farm. Salem's bats struggled, getting swept in a doubleheader, while Greenville was shut down by a 2012 top pick. The offense led the way, as Pawtucket completed a four-game sweep of the Gwinnett Braves (ATL), winning 14-9. Seven players had multi-hit games for the PawSox, and every starter in the lineup scored a run. Kyle Kaminska has retired from baseball, reports Salem Red Sox announcer Evan Lepler. Kaminska pitched for three different organizations in the last seven seasons, the Red Sox being the latest after they acquired him in December from the Pittsburgh Pirates as the player to be named later in the Zach Stewart deal. Kaminska, 24, was originally drafted by the then Florida Marlins in the 25th round of the 2007 draft out of Naperville High School in Illinois. The right-hander split his time evenly between relieving and starting in his seven-year professional career, but had spent all of this year starting with Portland then with Salem before calling it quits. 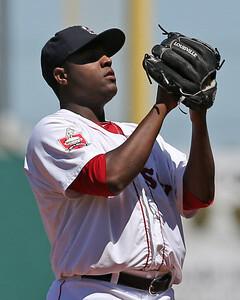 Red Sox General Manager Ben Cherington announced in an interview on WEEI that Pawtucket reliever Jose De La Torre will be promoted to Boston, with Allen Webster returning to the PawSox after his disastrous start on Wednesday. To make room for De La Torre on the 40-man roster, Joel Hanrahan was moved to the 60-day disabled list. This will be De La Torre's first major league call-up. De La Torre was acquired from Cleveland in exchange for Brent Lillibridge in July 2012. He's pitched well in Triple-A this season, with an ERA of 1.56 in 17 1/3 innings out of the bullpen. Last season, he combined to throw 74 innings between Double-A and Triple-A, and he also threw another 24 1/3 innings this winter in the Roberto Clemente (Puerto Rico) Baseball League. He performed well in each league, but it was not until 2013 at the World Baseball Classic that he put himself on the map. 5/9 Cup of Coffee: On a day when the major league team struggled on the mound, the most relieving news to come out of the minors was hurler-centric: Terry Doyle threw six scoreless for Pawtucket, and Franklin Morales was sharp in his two-inning rehab appearance in Portland. 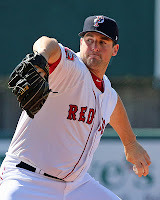 Right-hander Doyle had his best game since his season debut, shutting out the Gwinnett Braves (ATL) for six innings, scattering four hits and two walks, while striking out five in the Pawtucket Red Sox’s 4-1 road win. Garin Cecchini is hard not to notice on a baseball field, no matter the circumstances. You’ll hear him shouting back and forth with teammates during infield drills before games, and hours later he’ll still be calling encouragement to his pitcher from third base in a near-empty stadium during extra innings. But this year with High-A Salem, after a solid if unspectacular full-season debut in 2012 with Greenville, Cecchini is making opponents, teammates and scouts alike take note of his bat -- and he’s doing it pretty much every day. 5/8 Cup of Coffee: It was an up-and-down day for the affiliates, as Pawtucket and Salem were victorious thanks to Alfredo Aceves and Garin Cecchini, while Portland and Greenville's offenses both struggled in defeats. Pawtucket scored seven times without the benefit of an extra-base hit, cruising past the Gwinnett Braves (ATL), 7-3. Alfredo Aceves, who many assumed would be called up to Boston after Joel Hanrahan was injured, made his scheduled start for the PawSox, surrendering two runs in seven innings, while throwing 73 of his 105 pitches for strikes. Aceves gave up a two-run home run in the first inning, but that was all the Braves would get. A pair of high ceiling prospects earned this week's Pitcher and Player of the Week awards, as the SoxProspects community voted for Allen Webster (pictured) and Garin Cecchini to take home the honors. This marks the first time Webster has received the award in his career. Cecchini garners the accolade for the second week in a row, which increases his career count to four. After struggling in his April 27 outing to the tune of four runs and three walks in four innings, Webster rebounded on May 3 against the Durham Bulls to earn the first Triple-A victory of his career. The right-hander tossed six innings, allowing just one run on two hits while striking out nine batters -- two shy off his career high of 11, which occurred on May 14, 2010 when he was a member of the Single-A Great Lake Loons. He didn't walk a single batter, which was the second time this season he's achieved such a feat, and particularly of note since control had been an issue for him entering the season. Right-hander Allen Webster is scheduled to make the second start of his major league career on Wednesday after being called up to replace closer Joel Hanarahan, who was placed on the 15-day disabled list with a right forearm strain. 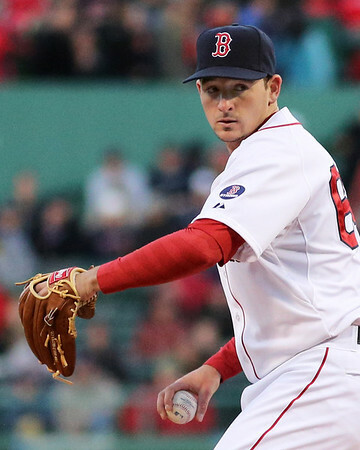 Webster, 23, will take the rotation spot of left-hander Felix Doubront, who will be temporarily moved to the bullpen, when he toes the rubber against the Minnesota Twins at Fenway Park. Doubront, who has posted a 5.71 ERA in five starts, is expected to make his next scheduled start. With Joel Hanrahan leaving Monday night’s game with soreness in his right arm hours after Andrew Bailey was placed on the 15-day disabled list, the Red Sox bullpen is in a state of flux. While there is a great deal of talent still remaining in the ‘pen, starting with right-handers Junichi Tazawa and Koji Uehara, the relief corps has shouldered a considerable load recently, tossing 15 innings over the past four games. Andrew Miller has pitched in three consecutive games, Clayton Mortensen in three of the last four, and Uehara pitched both Saturday and Sunday and was warming up to pitch last night when the Sox walked off in the bottom of the 11th. Whether or not Hanrahan is placed on the disabled list, the Boston bullpen is in need of reinforcements, at least temporarily. 5/7 Cup of Coffee: It was a sweep for Red Sox affiliates on an abbreviated schedule. Portland and Pawtucket were both led by a pair of top pitching prospects, while Greenville was rained out. It was a another strong performance for Rubby De La Rosa (pictured), as Pawtucket earned a 5-1 victory over the Gwinnett Braves (ATL). The right-hander entered the game knowing that his pitch limit had been raised to 70, but he needed only 56 pitches to get through four shutout innings. De La Rosa allowed three hits and struck out six without walking a batter. After a difficult start to the season, De La Rosa has now thrown 10 1/3 consecutive scoreless innings dating back to April 18.